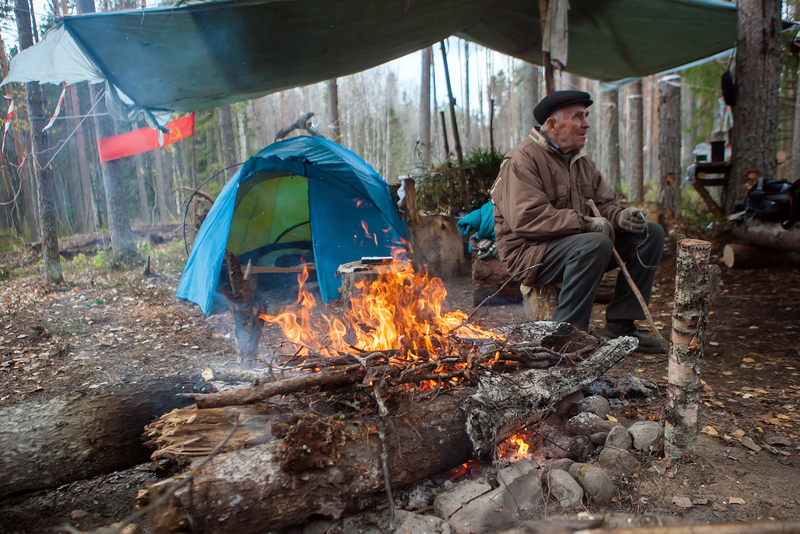 For over four months already, pensioners from a small village in Karelia have been taking turns to live in a tent in a local forest. Their aim is to prevent logging vehicles from felling the forest that their livelihood depends on. The protesters have become known as the Suna Partisans. The remote village of Suna (492 miles north of Moscow) in the northern region of Karelia is populated mainly by elderly people. There are no jobs in the village. In the summer, the wooden houses standing on the river bank become home to vacationing city residents, but by October most of them are deserted. The only houses that are looked after all year around are those where the elderly local residents live. Some time ago, Suna pensioners came up against a serious problem: The forest where they pick mushrooms, berries and medicinal herbs came under threat. In the summer, a company called Saturn Nordstroi began to fell the forest for a quarry mining project. The pensioners rose up to protect their woodland, setting up a camp where they take turns to be on duty every day. The camp consists of a large yellow tent and a table with some food and teabags lying on it. There is a fire that is kept burning all the time, with a blackened kettle on it. The weather is becoming colder with each passing day. The protesters have been camping here for more than four months already, taking turns to man the site. There are at least two activists at the camp at any given time: They say it would be “unsafe” to stay there alone. There are many who present a danger in the forest apart from the loggers: There are bears, elks, and wolves roaming around. The Suna Partisans carry a whistle – it may come in handy if they need to startle a bear. Pensioner Tatyana Romakhina is in her 60s. Her reason for protecting the forest is very simple: “We need to survive somehow,” she says. The forest defenders object to the project for which the forest is to be cut down, described as an investment. The partisans maintain that the director of the company behind the project, Igor Fedotov, has promised not to hire any local residents. “This will bring no benefit to local residents,” says Darya Kalikina, an activist from Petrozavodsk. Having heard about the protest, Kalikina set up an online petition against the mining of a sand and gravel quarry and decided to attract volunteers for the camp, since “she felt sorry for the old people.” This led to about a dozen volunteers joining the project. When the conflict was reported by the media, the felling was suspended. The logging vehicles have indeed been removed, with only a strong smell of diesel oil and an abandoned worker’s uniform remaining at the site. However, the protesters are not convinced that felling will not resume the moment they leave their camp, so they continue to guard it. “This dispute has two truths. On the one hand, there is the tenant who has all the licenses, permissions, a court ruling. On the other, there are local residents who are actively opposed to the quarry mining. A tent camp is no way to resolve a conflict. What is needed is a dialogue and a search for a compromise,” said the press service. Fedotov sees himself as a hostage to the situation and hopes that it will be possible to reach an agreement with the protesters, including through holding roundtable discussions. He is encouraged by the fact that at the second roundtable, all the participants stayed till the end instead of storming out. By way of a compromise, the businessman has promised to render assistance to the nearby villages of Yanishpola and Suna: to supply them with sand and gravel mix to repair local roads, and to assist them with rubbish removal. In the meantime, the elderly protesters are stocking up on logs in order to continue their vigil in the forest, which will be very cold in the winter. This is an abridged version of an article first published in Russian in the Kommersant Vlast magazine.